The dreaded 'Aussie flu' is more severe than the Swine flu pandemic of 2009 which killed nearly 300,000 people across the world, an expert has warned. Peter Horby, professor of emerging infectious diseases and global health at Oxford University, believes this winter 'may well be worse than others'. His fears come amid the emergence of H3N2, an aggressive strain of influenza A that rocked Australia during its winter and triggered triple the usual number of cases. Some scientists fear H3N2, which has also struck France, could also prove as deadly to humanity as the Hong Kong flu in 1968 when one million people died. However, Britain is being attacked by several strains simultaneously. Usually, just one subtype, either influenza A or B, is responsible for the majority of cases. A grandmother struck down with Aussie flu has revealed the killer virus circulating the UK has left her on the brink of suicide. Wendy Waite, 47, from Devizes, Wiltshire, caught the bug in the run-up to Christmas - but is still suffering from its brutal side effects. Speaking exclusively to MailOnline, the shop worker, who has nine grandchildren, described it as the 'worst illness I have ever had'. Mrs Waite claims her three-week battle with Aussie flu has left her with hallucinations and migraines so painful that she feels like 'screaming'. The pain also left her unable to walk up her own stairs - forcing her to crawl, and she became reliant on her husband lifting her in and out of the bath. She said: 'I did say to my hubby one night if there was an injection to end me off right now think I would do it. 'But I have four children and nine grandchildren and a smashing hubby so it was just a spur of the moment madness. Tests have yet to confirm if Mrs Waite has been infected with the H3N2 strain of flu, which is more commonly referred to as influenza A. The rapid spread of a strain of influenza B which is not covered in a vaccine given to the elderly, known as B/Yamagata, has raised concerns. But Professor Horby added: 'The current B virus that’s dominant is not included in the standard vaccine this year – the one given to children. It comes after an bed-ridden actress, from Harrogate, revealed she cries every day and is left 'writhing in pain' after catching killer 'Aussie flu'. Julia Stringer, who has appeared in several programmes on BBC, ITV and Channel 4, described the agony as being like childbirth. The 42-year-old's comments came as a leading virologist predicted another cold snap will fuel the spread of H3N2 and 'kick cases into another orbit'.Professor John Oxford, of Queen Mary University in London, exclusively warned that the killer virus spreads much easier when temperatures plummet. Forecasters believe the weather will continue as it is currently for the next few days - forcing adults to flock indoors and be surrounded by others. This leaves them susceptible to catching H3N2 or another type of the deadly virus that is currently active. Professor Oxford also revealed he is keeping his 'fingers crossed' as he fears the current epidemic in France could replicate itself in Britain. The European country has been rocked by an 'exceptional' outbreak, with nearly 12,000 people having been left hospitalised and more than 30 dead. Figures show the UK is heading the same way, with scientists concerned the flu causing havoc on the over-stretched NHS is 'unpredictable'. APRIL 24 2009: The Health Protection Agency says it is monitoring a deadly swine flu outbreak in Mexico and the United States after more than 60 people worldwide die after contracting the virus. APRIL 26: Iain and Dawn Askham, of Polmont, near Falkirk, confirmed as the first UK cases of swine flu after returning from their honeymoon in Mexico. JUNE 11: The World Health Organisation announces the swine flu outbreak is now a pandemic. JUNE 14: Jacqui Fleming, 38, of Glasgow, becomes the first person in the UK to die after contracting the virus. Mrs Fleming died two weeks after her son, Jack, was born 11 weeks prematurely. He died on June 15 - but not from swine flu. JULY 2: The UK moves past the stage of containing the swine flu outbreak and into the 'treatment phase', with hundreds of cases recorded every day. JULY 9: The Government's chief medical officer, Sir Liam Donaldson, confirms 14 people in the UK have now died after contracting swine flu. JULY 10: A hospital patient from Essex becomes the first person without underlying health problems to die after contracting swine flu. JULY 23: New swine flu website receives 2,600 hits per second and crashes within minutes of launching. SEPTEMBER 3: Government scientists revise estimate of the number of people in the UK who could die to a 'worst case scenario' of 19,000, down from the estimate of 65,000 two months earlier. OCTOBER 21: Mass swine flu immunisation programme gets under way. OCTOBER 25: A hard-hitting Government advertising campaign about how easily swine flu can spread, using the slogan Catch It, Kill It, Bin It, is announced. DECEMBER 10: Sir Liam Donaldson says the pandemic is 'considerably less lethal; than feared, with 26 deaths for every 100,000 cases in England. JANUARY 8 2010: The number of new cases in the UK falls significantly, to fewer than 5,000 new cases in a week, but the death toll rises to 360. 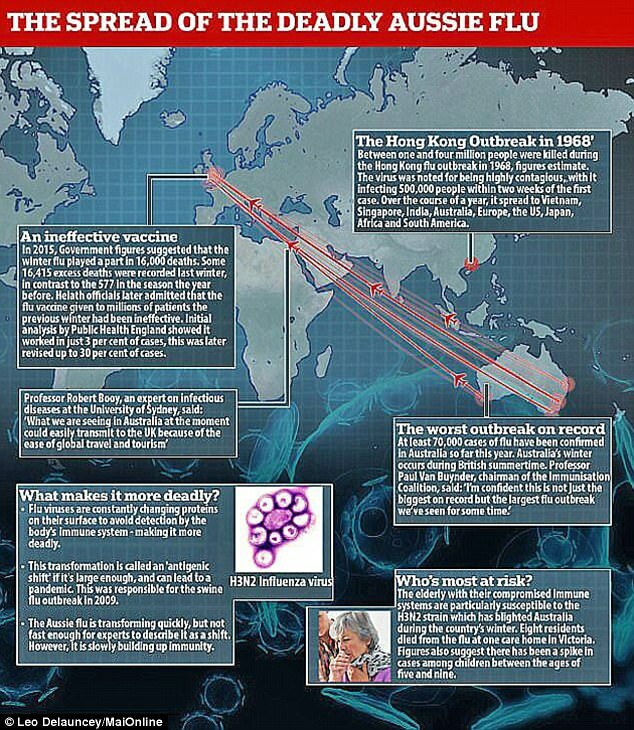 MARCH 18: New figures reveal there have been 457 deaths in the UK since the pandemic began. MARCH 25: An independent review of the UK response to swine flu is announced, headed by former Welsh Chief Medical Officer Dame Deirdre Hine, which will make recommendations about what should be done in the event of future flu pandemics. The rocketing cases prompted Marisol Touraine, the country's health minister, to delay non-urgent operations to free up hospital beds.This controversial move was mirrored by Jeremy Hunt last week, with the NHS having being plunged into chaos amid a spike in flu cases. Mr Hunt, made Health and Social Secretary in Prime Minister Theresa May's cabinet reshuffle yesterday, made the unprecedented decision to cancel 55,000 operations. Experts have already warned of a 'double-whammy' of new cases, as kids head back to school and swarms of travellers return from flu-hit France. No areas of the UK are believed to be free of the potentially fatal bug, which has forced GPs to cancel holidays and work late into the night. Figures released yesterday show cases of the contagious virus have soared by 70 per cent in a week - with 2,810 new people struck down in the last seven days. This winter's outbreak appears to be nine times more severe than that of 2015/16 - when just 296 cases of flu had been recorded at the same point. Nearly 50 people have already been killed by the bug this year and at least 1,078 people have been hospitalised - 252 of which were caused by the 'Aussie flu' strain. Statistics from Public Health England reveal how many people were infected during week 1 of the previous four winters. 'None greater than the birth of my son Conor Jr and the continued support of my family, my friends and my dedicated staff through thick and thin. 'Some 137 were caused by H1N1, which triggered the 1918 Spanish Flu pandemic that killed 50 million. A further 291 strains of influenza A were unidentified.Professor Andrew Easton, a leading virologist at Warwick University, told MailOnline that there is nothing unusual about this year's outbreak so far. However, on the back of Public Health England figures released today, he warned that 'you really can't predict how it's going to go'. Speaking exclusively, he said: 'Every year there are problems because of outbreaks, and while predictable, they do cause difficulties. 'If numbers do continue to rise then those problems will continue and won't go away and they will put much more pressure on the system. 'But we're going to have to wait and see, you just don't know. We would expect the increases to continue for a few weeks before it reaches its normal peak'. Fears of Aussie flu have prompted a surge in sales of the flu vaccination this year – despite concerns they are ineffective, figures show. Data from a leading high street retailer show a staggering 166 per cent increase in sales of the jab for the first week of 2018 compared to last year. Superdrug has claimed ‘Aussie flu’ is likely to blame, amid fears the killer virus will prove as deadly to humanity as the Hong Kong flu in 1968 when one million people died. The figures, seen by MailOnline, come as health officials admitted the trivalent jab that has already been dished out to thousands may be targeting the wrong strain. Public Health England announced the cheaper vaccine is not effective against a common type of influenza B which is currently circulating. An analysis of 25 cases of influenza B revealed 21 have been caused by the B/Yamagata type - which isn't covered by the cheaper jab. 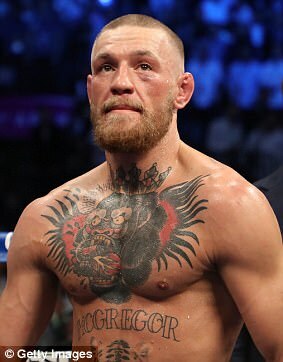 sie flu'UFC fighter Conor McGregor has been struck down by deadly 'Aussie flu', which could be the worst bout Britain has seen in 50 years. Flu viruses are constantly changing proteins on their surface to avoid detection by the body's immune system - making it more deadly.This transformation is called an 'antigenic shift' if it's large enough, and can lead to a pandemic. This was responsible for the swine flu outbreak in 2009. Relax! - Aussie or whatever flu will not kill even a single person, if everybody (including those already sick) start doing my discovery (just an exercise for a minute a day), for any viruses and other pathogens will be killed the moment they touch us - By my WVCD - The Weapon of Virus and Cancer Destruction, that cures and prevents any diseases, known on Earth, even Aging, for every cell of our bodies is shielded 100% from any external/internal (genetic) detrimental impact - For more than seven years now I never got sick even of the Common cold, my blood sugar level is 300 mg/dL (normally a killing level), but I am not sick of Diabetes, for I cannot get sick of it, or of any other diseases - I will describe my WVCD to everyone, who sends me an e-check for one million US Dollars (money can be negotiated) - Doing my discovery for just a minute a day, everybody will stay absolutely healthy all the time, living their Endless Lives, for Infinite Health = Immortality.